Delphi University Schools of Healing, Channeling, and Metaphysics offer numerous Certification Programs, and Practitioner, Bachelors, Masters, and Doctorate level Degree programs in Energy Healing and Alternative Healing Methods, Metaphysics, Psychic Development, Spiritual Training, Entura Spiritual Art, and RoHun Transpersonal Spiritual Psychology. For over 40 years we have trained people from all walks of life to develop, refine, and reliably express their Spiritual Gifts and Abilities, to grow, heal, and enrich their lives, and to help others. Class size is small, training is experiential, and our teachings are delivered in love, wisdom, and fun. Your experience at Delphi will be transformative and life-changing. 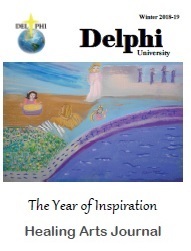 We invite you to fulfill your highest and greatest potential here at Delphi University. The Luminara Wellness Center at Delphi offers cutting-edge Services designed to significantly add to your well-being. Today is a very special Day… it’s Graduation Day….the Celebration Day. It is the Day that Spirit celebrates our evolution in awareness and consciousness. It is the Day that our amazing teachers celebrate our transformations. It is the day that our Souls dance in gratitude and joy celebrating us for answering the call to go deeper within, empowering our connection with God. It is the day where our hearts are filled with divine light celebrating our infinite desire to fulfill our Creator’s dream to come closer and closer to our vocation, our purpose, and our mission. Delphi University offers Certification and Degree Programs in Spiritual Training, Complementary & Alternative Energy Healing, Metaphysics, Psychic Development, Spiritual Art, and Transpersonal Psychology through an extensive, experiential, time-proven, and knowledge-based curriculum. Spiritual healing therapies and techniques that empower healers and healing professionals, personal growth and healing, self-improvement, and spiritual enlightenment and empowerment is the mission and the purpose of Delphi University.